WePay, a Y Combinator backed startup that aims to take the hassle out of group paying, is making its platform more social today with the launch of two Facebook apps that help users collect money for events and groups. WePay’s Sell Tickets app allows users to sell tickets for any Facebook Event and lets users create an event directly from the app itself. Similarly, the Collect Money app gives users the ability to collect money from members of any Facebook Group. All payments that take place are redirected to WePay’s site, ensuring security for credit card and bank account payments. As we wrote in our initial coverage of the payments platform, WePay is a dead simple way to collect, manage and spend money for groups. WePay, which launched to the public earlier this year, of course faces competition from online payments giant PayPal. But there is a slight difference between the two platforms. With PayPal, your account is tied to your name, without any way to separate the payments associated with a group. On WePay, you can create a unique, FDIC insured account for each group. While the account is still associated with your name, but you can keep each group account totally separate from your personal transactions. Group money can essentially be kept separate from any individual accounts you may have. You can also designate specific individuals to have control over accounts. From accounts on WePay, users can send emails with electronic bills (which can be paid with bank accounts or credit cards) and spend funds with a WePay VISA prepaid card, paper checks, or electronically. If group members don’t pay soon, the site will automatically remind them a few days later. WePay makes money by charging a 3.5% transaction fee (there’s also a different plan that charges 50 cents per transaction and limits you on the methods of payment you can accept). With more than 3.5 million Facebook Events being added to the network each month, WePay’s ticket selling application could gain traction. 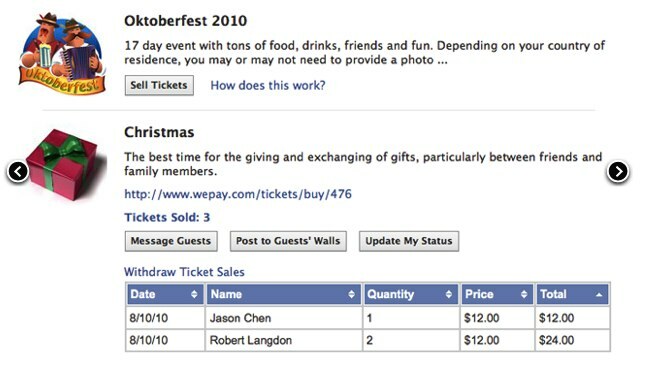 Of course, Facebook appears to have a partnership with Eventbrite for ticket sales on the network. But the simplicity of WePay’s Group paying app should also be attractive to users who are looking to collect money from college clubs, sports clubs and more. WePay just raised $7.5 million in Series B funding a few weeks ago, and plans to start encouraging other startups to incorporate WePay’s API into their services.